Corian® is a modern material that can best be described as a cross between laminate and granite. It has the beauty of natural stone, but it is not as expensive, and it is more versatile in its design. Gold Canyon Corian® countertops can help you achieve the look of more expensive stone, and help minimize the look of any seams! Corian® is known as a solid surface countertop. The reason lies in the way it is made. A blend of acrylic polymers and stone aggregate is poured into a mold and allowed to harden. The half-thick sheets are consistent all the way through. If you cut into the countertop, the inside would look the same as the outside. Because solid surface countertops are created by pouring the materials into a mold instead of being cut, they are nearly seamless. If you are installing or repairing a Corian® countertop for your Gold Canyon home in bathroom or a smaller kitchen, you can get a single piece. However, if you have a very large kitchen, you may need to put together a couple of pieces, which would create a seam. If you know that you cannot avoid a seam, you can plan your design so that the seam falls exactly where you want it so that you create the look that you want. You may not be able to avoid the seam, but you can keep it out of sight and out of mind. One way you can do this is to plan the seam in a location where you will be placing appliances. Plan to connect the countertop pieces in that corner where you will be putting your huge espresso machine or your toaster oven. The appliances will cover the seam, and you will never have to see it. You can also hide the seam with your choice of countertop design. Thanks to advancements in the creation of Corian® countertops, they are now available in hundreds of colors and patterns. If you choose the right repeating pattern, the seam can blend right in and virtually disappear. The seam can fall anywhere on the countertop without ruining the look you want to create. Corian® can be used for your backsplash, as well. Using it as the backsplash provides durable protection while also creating a consistent design for the kitchen or bathroom. Backsplashes can be a few inches, or they can cover a huge portion of the wall. You can plan the seam along the backsplash, which is where many would expect to find it. However, you can also add a backsplash without any seam. Corian® can actually be molded into any shape, so the counter can merge with the backsplash seamlessly. You can even get a unique shape, such as a countertop that rounds up into the backsplash. The sink is an expected interruption to the countertop. You can easily break up a large countertop space with an apron or farm sink. However, because Corian® can be molded to any shape, you can also choose a countertop that blends directly into the sink, or replace it with a full Corian sink. You can even choose accessories like drains that are formed right into the counter top. You will eliminate seams around these areas and create a modern, minimalist look. Seams can stand out more on certain colors and among certain patterns. Even if you don’t want to choose a countertop with a repeating pattern that will hide the seam, you can still choose colors and patterns that will minimize the look of the seam. You can choose from grain shapes that range in size from sand to pebbles. Glass can even be incorporated into the mix to give it a special look and a bit of shine. Striations, veins, and mottling can all be included in the surface also. All of these choices can help you achieve the look of more expensive stone, and they can help you to minimize the look of any seams that you have to have. Corian® is a wonderful surface that helps you achieve a beautiful look for your kitchen or bathroom while also minimizing your maintenance. It is a durable surface that is easy to restore and repair when necessary. 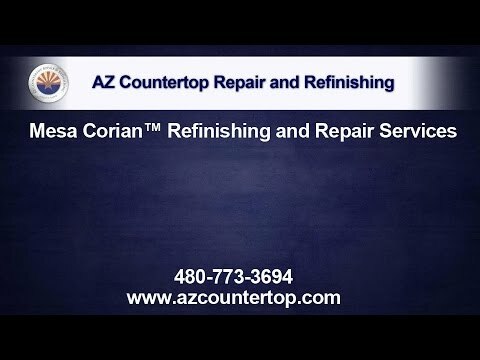 AZ Countertop Repair and Refinishing offers professional Corian® repair and maintenance. Our experienced technicians can remove surface scratches, repair larger scratches and gouges, and remove stains. Your countertops can be restored to their original beauty. We also provide maintenance services to help keep your Corian® surfaces in top shape and minimize these issues. Call us in Gold Canyon, Arizona today to schedule service for your Corian® countertops or other surfaces.